We want visitors to tell their own "places of invention" stories through the interactive map within the exhibition gallery and on our website. I usually write about history, but I had the opportunity to try out a different storytelling technique firsthand when I participated in a digital storytelling workshop led by the New Media Studio at the University of Maryland, Baltimore County. Watch "Through Natalie's Eyes: A Places of Invention Digital Story"
What's digital storytelling? At its most basic, it is combining a personal story with images and audio in a short, simple movie. Since I have been researching Hollywood in the 1930s for the Places of Invention exhibition, I decided to experiment with turning my digital story into a movie about the movies. I have to emphasize that the resulting short video is only a not-ready-for-prime-time student project! But here's my little story about the big screen. I grew up on movies. My Mom loves them. She tells me about spending long afternoons as a teenager in a darkened theater with her best friend. Growing up, the only times that I was allowed to stay up past midnight were New Year’s Eve . . . and the night of the Academy Awards. I still love movies. One of my favorites is The Wizard of Oz. I know, not very original. But the reason I never tire of it isn't the over-the-rainbow, there's-no-place-like-home storyline. It's the color. That hurt-your-eyes Technicolor was the creation of two Massachusetts Institute of Technology grads (the "Tech" in "Technicolor") named Herbert Kalmus and Daniel Comstock and technician W. Burton Wescott. Their first lab was in a railroad car in Boston. Technicolor went through several iterations before it blossomed so gloriously in The Wizard of Oz. 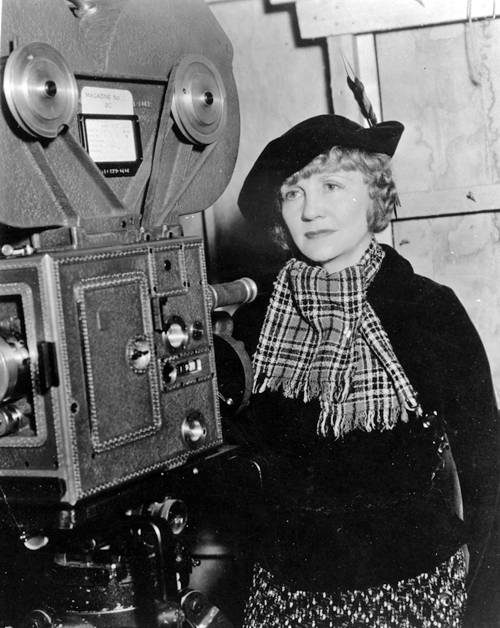 Natalie Kalmus at the 3-strip Technicolor camera, about 1938. Courtesy of Mark Wanamaker/Bison Archives. Outside the lab, one person took on the job of making Technicolor movies consistent, spectacular, and lush productions in the Golden Age of Hollywood. That person was Natalie Kalmus, Herbert's ex-wife. A former art student, Natalie was the color authority on the set. She made decisions about makeup, costumes, sets, and lighting, and even went behind the camera as a cinematographer a few times. She controlled (some say with an iron fist) the aura of Technicolor. Natalie Kalmus was the ultimate mediator between the lab and the silver screen, unwavering in her commitment to make Technicolor shine. Her vision was behind some of the most gorgeous films ever made. My Mom and I still watch The Wizard of Oz together when we can. And I always point out Natalie’s credit line at the beginning of the film. Ironically, it’s not in Technicolor.